The heart is a pump made up of muscle tissue. Like all pumps, the heart requires a source of energy to control pumping blood from one chamber to the next. This source of energy is the body’s own electrical system and when that electrical system doesn’t work right, children may be diagnosed with a heart rhythm disorder, also referred to as an arrhythmia. Not allowing the ventricles (lower chambers) to fill with enough blood, because an abnormal electrical signal is causing the heart to pump too fast. Not allowing enough blood to be pumped out to the body because an abnormal electrical signal is causing the heart to pump too slowly or too irregularly. The symptoms of arrhythmias may be similar to other medical conditions or heart problems. Caregivers should always consult the child’s doctor for a proper diagnosis. Another sign that a child may have an arrhythmia is a change in the electrocardiogram (ECG or EKG) pattern. An electrocardiogram is a special test that allows doctors to look for irregular heart rhythms. There are a number of different types of electrocardiograms that doctors can use to detect or diagnose a child’s arrhythmia. Learn more about electrocardiograms. What are the different types of arrhythmias? The heart has naturally occurring pacemaker nerve cells in the atria and ventricles of the heart. An atrial arrhythmia is an abnormal rhythm or heartbeat caused by abnormal function of the sinus node or the atrioventricular node. Abnormal heartbeats can also be caused by the development of other electrically charged cells making another atrial pacemaker within the atrium that takes over the function of the sinus node. A ventricular arrhythmia is an abnormal heartbeat or arrhythmia caused by an abnormal conduction of electrical signals within the ventricles. In these cases, the sinus node and atrioventricular node may function normally but the child still has an abnormal heartbeat. Arrhythmias can also be classified as slow (bradyarrhythmia) or fast (tachyarrhythmia). “Brady-” means slow, while “tachy-” means fast. Sinus arrhythmia. A condition in which the heart rate varies with breathing. Sinus arrhythmia is commonly found in children, and is not considered to be a dangerous condition. Sinus tachycardia. A condition in which the heart rate is faster than normal for the child’s age because the sinus node is sending out electrical impulses at a rate faster than usual. Most commonly, sinus tachycardia occurs as a normal response of the heart to exercise when the heart rate increases. Sinus tachycardia can be completely appropriate and normal, such as when a child is exercising. However, it may cause symptoms, such as weakness, fatigue, dizziness or palpitations if the heart rate becomes too fast to pump an adequate supply of blood to the body. Sinus tachycardia is often temporary, happening when the body is under stress from exercise, strong emotions, fever or dehydration. Once the stress is removed, the heart rate should return to its usual rate. Sick sinus syndrome. This condition is not common in children and takes place when the sinus node sends out electrical signals either too slowly or too fast. Premature supraventricular contractions or premature atrial contractions (PAC). A condition in which the natural atrial pacemaker site above the ventricles sends out an electrical signal early. The ventricles are usually able to respond to this signal, but the result is an irregular heart rhythm. PACs are common and may occur as the result of stimulants such as coffee, tea or medications. Supraventricular tachycardia (SVT), paroxysmal atrial tachycardia (PAT). A condition in which a series of early heartbeats are triggered from an atrial or junctional pacemaker site above the ventricles. This condition speeds up the heart rate artificially (without exercise). PAT usually begins and ends rapidly, occurring in repeated periods. This condition can cause symptoms such as weakness, fatigue, dizziness, fainting or palpitations if the heart rate becomes too fast. This condition is the most common type of abnormal tachycardia in children, and is sometimes referred to as paroxysmal supraventricular tachycardia (PSVT). Atrial flutter. A condition in which the electrical signals come from the atria at a fast but regular rate, often causing the ventricles to contract faster and increase the heart rate. Atrial fibrillation. A condition in which the electrical signals come from the atria at a very fast and erratic rate. The ventricles contract in an irregular manner because of the erratic signals coming from the atria. Premature ventricular contractions (PVCs). A condition in which an electrical signal begins in the ventricles and causes them to contract before receiving the electrical signal to do so from the atria. PVCs are not uncommon and typically do not cause symptoms or problems. However, if the child begins getting PVCs more often, he or she may experience weakness, fatigue, dizziness, fainting or palpitations may be experienced. Ventricular tachycardia (VT). A life-threatening condition in which an electrical signal is sent from the ventricles at a very fast but often regular rate. If the heart rate is sustained at a high rate for more than 30 seconds, symptoms such as weakness, fatigue, dizziness, fainting or palpitations may be experienced. A person in VT may require an electric shock or medications to convert the rhythm back to normal. Ventricular fibrillation (VF). A condition in which many electrical signals are sent from the ventricles at a very fast and inconsistent rate. As a result, the ventricles are unable to fill with blood and pump. This rhythm is life-threatening because there is no pulse and complete loss of consciousness. A person in VF requires emergency medical attention, as it will result in sudden cardiac death if not treated within seconds. Wolff-Parkinson-White Syndrome (WPW). A condition in which an electrical signal may arrive at the ventricle too fast due to an extra conduction pathway or a shortcut from the atria to the ventricles. This condition often results in a rapid heart rate. The symptoms of various arrhythmias may resemble other medical conditions or heart problems. The specialists at the CHOC Children’s Heart Institute carefully work with each patient to ensure a proper diagnosis and treatment plan. Electrophysiology ablation. Once the abnormal cells generating an abnormal heartbeat are found during an EP study, the electrophysiologist uses mild radiofrequency heat energy to destroy or “ablate” the problem area. Other types of ablation techniques may be used, such as cryoablation, which uses very cold temperatures to destroy the problem area. Once the tissue is destroyed, the abnormal electrical signals that created the arrhythmia can no longer be sent to the rest of the heart. 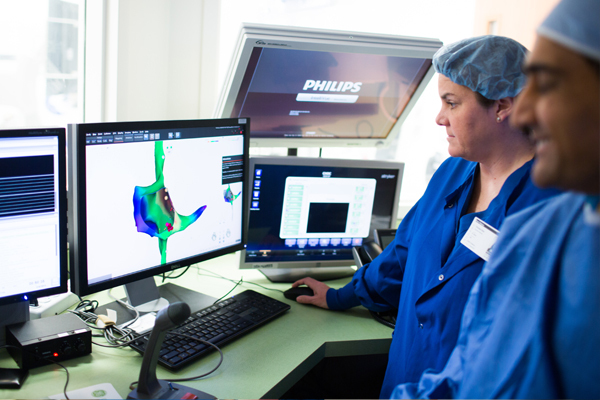 Learn more about EP studies and ablation in our state-of-the-art catheterization labs. Pacemaker. A pacemaker is a small electronic device that is inserted into the chest just below the collarbone that helps regulate electrical problems with the heart. When a problem develops, such as a slow heart rate, a pacemaker may be recommended to ensure that the heartbeat does not slow to a dangerously low rate. CHOC Children’s is proud to offer one of the largest pediatric pacemaker and defibrillator clinics in the region. Learn more about pacemakers and the Pacemaker and Implantable Cardioverter Defibrillator (ICD) Program at CHOC Children’s. Implantable cardioverter defibrillator (ICD). Similar to a pacemaker, an implantable cardioverter defibrillator (also referred to as a “defibrillator”) is an electronic device that is inserted just below the collarbone. It is used to help regulate electrical problems with the heart using wires with electrodes on the end that are placed in specific areas of the heart. The defibrillator responds to irregular rhythms to prevent sudden cardiac arrest. Learn more about ICDs and the Pacemaker and Implantable Cardioverter Defibrillator (ICD) Program at CHOC Children’s. Medication. Some heart arrhythmias may be controlled by medication due to the type of irregular heart beat or because a child is not a good candidate for certain procedures because of his or her age, size or other health conditions. Electrophysiology is the study of the electrical systems of the heart. Electrophysiologists at CHOC Children’s diagnose and treat arrhythmias in patients of all ages—from the tiniest babies to young adults. Our program is one of the only dedicated pediatric electrophysiology programs in the region and one of the first in the nation to perform radiation free electrophysiology studies. Learn more about the Electrophysiology Program. The heart is a pump made up of muscle tissue. Like all pumps, the heart requires a source of energy to work. The heart’s pumping action is controlled by an electrical conduction system that coordinates the contraction of the chambers of the heart. An electrical stimulus is generated by the sinus node (also called the sinoatrial node, or SA node), which is a small mass of tissue located in the right atrium (right upper chamber) of the heart. The sinus node generates an electrical stimulus regularly (60 to100 times per minute under normal conditions). 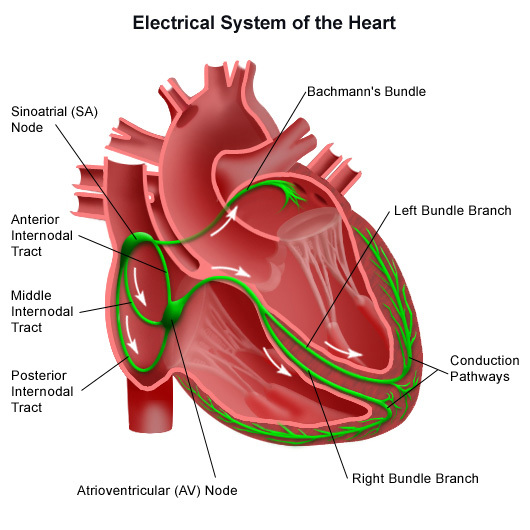 This electrical stimulus travels down through the conduction pathways (similar to the way electricity flows through power lines from the power plant to a home) and causes the heart’s lower chambers to contract and pump out blood. The right and left atria (the two upper chambers of the heart) are stimulated first and contract a short period of time before the right and left ventricles (the two lower chambers of the heart). The electrical impulse travels from the sinus node to the atrioventricular node (also called AV node), where impulses are slowed down for a very short period, then continue down the conduction pathway via the bundle of His (a bundle of special heart fibers) into the ventricles. The bundle of His divides into right and left pathways to provide electrical stimulation to the right and left ventricles. Normally at rest, as the electrical impulse moves through the heart, the heart contracts about 60 to 140 times a minute, depending on a person’s age. Each contraction of the ventricles represents one heartbeat. The atria contract a fraction of a second before the ventricles so their blood empties into the ventricles before the ventricles contract. Our pediatric cardiologists are available to provide consultations and second opinions to families and referring physicians. If you are pregnant and would like a prenatal consultation, our team of fetal cardiologists are available for families and referring physicians to provide immediate consultations, second opinions and fetal echocardiograms for pregnant women. Our office is open 8 a.m. – 5 p.m. We schedule appointments within 48 hours, and offer same day appointments for urgent cases. Get more information about the CHOC fetal cardiology program.